Revision is boring my pants off so I have decided to do a quick post and share some of my latest 'bits and bobs' with you. As you all know, last week I travelled up to Manchester to see my family and I ended up doing quite a bit of shopping there. Besides buying lots of clothes (and shoes) I also picked up some gorgeous bits and bobs which I felt rather necessary to share with you. 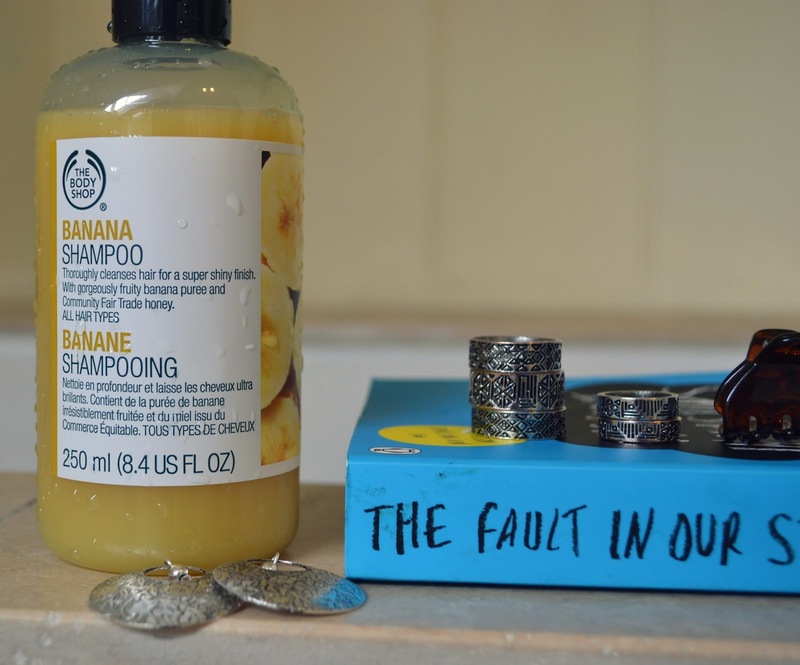 The Body Shop Banana Shampoo [4.50] - Ok, the truth behind this shampoo is that it was actually recommended to me by a fellow blogger. Claire from Dainty Ghosts [make sure you give her a visit] recommended this shampoo via twitter - the words 'banana' and 'shampoo' in the same sentence majorly appealed to me! The shampoo smells delicious (like bananas funnily enough) and leaves my hair super shiny and soft. People have even said how glossy it looks - big bonus points! This is definitely one of my favourite haircare products right now. Floral Patterned Accessorize Earrings [£3.50] - I am such a huge sucker for silver jewellery - I almost never wear gold. For £3.50 I could not resist these gorgeous floral cut-out hoop earrings. They're so pretty and perfect for boho summer style. Forever 21 Jet Setter Ring Set Silver [£4.90] - Rings, rings and more rings! I love wearing rings and have jumped on the midi-ring bandwagon big time. They're like decorations for your hands! These aztec patterned rings are chunky, funky (wehey!) and are simple yet stylish additions to any outfit. H&M Crocodile Haie Clips [£1.99] - I bought these cute little clips mainly because sometimes grips aren't enough to keep my hair back. They're simple, handy and great for people with thick hair. Rimmel Lasting Finish Orange Your Life Nail Polish [2.99] - I have been on the look out for a more out-there nail polish and couldn't resist Rimmel's 'Orange Your Life' nail polish. I first applied two coats and thought it was a little too bright, but after wearing it for a few days I am absolutely loving it! It's the perfect statement colour and looks great against dark clothing like blazers and leggings. 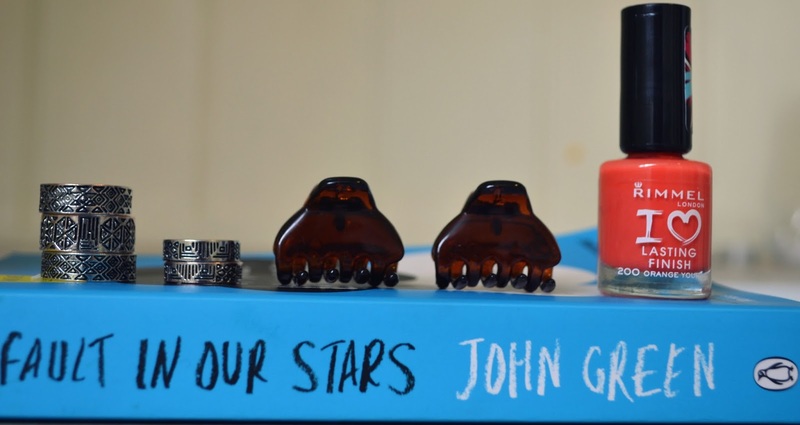 The Fault In Our Stars by John Green [£5.99] - Everyone has been absolutely raving about this book! After hearing numerous friends say how good it was, I thought I'd give it a go for myself. As my time is pretty occupied with revision at the moment I haven't managed to finish it yet but love what I've read so far. I'll definitely update you on this one soon! New Look White Daisy Bun Garland [£2.99] - This is one of my most favourite recent purchases. This cute daisy bun garland makes any bun look super pretty and adds a girlie touch. 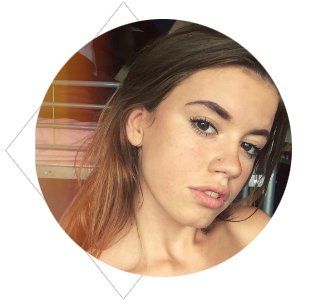 I've been wearing mine with my donut bun and can't wait to take it into festival season! Sorry I haven't posted much recently - coursework/revision is very time-consuming! I love the smell of the shampoo but I find it leaves my hair really tangled. So many cool rings! I wish I could wear rings more often. I like the way they look, but I find them so distracting when I'm trying to type or text. Sorry! I realized I used my school account for commenting instead of my blog account. Is there anyway you could delete my comment? I don't like having my last name out and about. (After you click delete comment, it leads you to another page where you can choose to delete forever and that should work.) Thanks!